IBM has unveiled plans to address an ongoing skills shortage in Singapore, through a pathways in technology initiative targeting early college high-schools across the country. The P-Tech launch is in partnership with the Institute of Technology education (ITE), Nanyang Polytechnic, Ngee Ann Polytechnic, Republic Polytechnic, Singapore Polytechnic and Temasek Polytechnic, and represents the first in ASEAN and the fifth globally, following the US, Morocco, Australia and Taiwan. The Singapore government has been transforming its educational system in recent years, promoting skills development over the acquisition of paper qualifications, and looking to countries such as Switzerland for inspiration in developing a skills culture across its educational institutions. “The urgent need for skilled STEM talent is a global phenomenon and one that IBM has been keenly aware of,” said Harriet Green, CEO and chairman of IBM Asia Pacific. 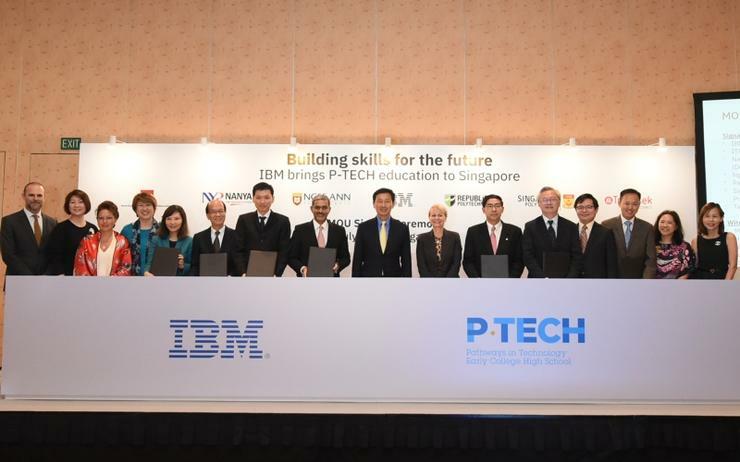 “P-Tech was a direct response by IBM to the global skills crisis and is very much in line with the needs and strategy of Singapore as a nation." The Singapore talent shortage is at its highest since 2008 with 56 per cent of employers finding it difficult filling jobs according to the Manpower Group 2018 Talent Shortage Survey. “We are extremely excited and privileged to be partnering with ITE and all the Polytechnics in Singapore to bring the P-Tech programme to life, effectively creating new learning pathways to much needed new collar careers,” said Green. “IBM is also actively on-boarding like-minded corporations to the P-Tech programme in Singapore, and we are very excited that our client and partner, Citi, has agreed to support P-Tech’s network of industry partners." The P-Tech programme will give ITE students early exposure to jobs in the information and communications technology (ICT) and other science, technology, engineering and mathematics (STEM) disciples. “Together with the growing P-Tech ecosystem, we will help students better understand the connection between their coursework, field experience, and the ‘real world’ expectations of the workplace,” said Green. Furthermore, the scheme will equip ITE students with competitive skills facilitating progression to Polytechnic Diplomas or ITE work-learn technical diplomas (WLTDs) in the ICT/STEM sectors. The first batch of approximately 40 students will enter the programme in January 2019, with that number to rise to 120 per batch over the coming years. “P-Tech will strengthen workplace learning opportunities for our ITE and polytechnic students,” added Ong Ye Kung, Singapore’s Minister for Education (Higher Education and Skills). “With workplace learning is becoming a critical part of education and training, we are especially encouraged that IBM with be working with ITE to develop and launch a new WLTD, broadening opportunities for ITE graduates in the ICT field. “It will marry ITE’s expertise in education with IBM’s industry knowledge and experience." A range of experiences will be provided to students from participating organisations including mentorships and internships along with ‘first in line’ job opportunities. “Nanyang Polytechnic is happy to be part of the P-Tech initiative to nurture the next generation of STEM talents,” said Edward Ho, deputy principal (development), Nanyang Polytechnic. “The programme will give participants valuable coaching and internship opportunities with IBM and other participating industry leaders. This is yet another opportunity for NYP to work collaboratively with our industry partners like IBM." The P-Tech programme was started in the US in 2011 in New York City, growing to more than 90 P-Tech schools across the US and other countries with more than 450 participating businesses to date.